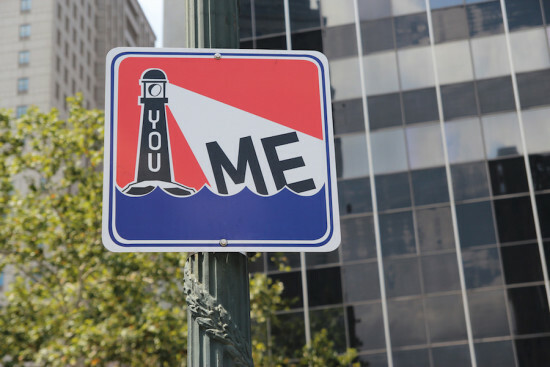 Manhattan-based artist Steve Powers is offering a non-caffeinated pick-me-up for weary NYC commuters with his pop art–style street signs mounted on light poles around the city. Bearing food-for-thought slogans with themes of life and love against a pictograph or logotype, such as "I get lost to get found" stamped on a briefcase, the signs are designed to inspire smiles and/or introspection. Titled ICY Signs, the temporary public art signage project takes after traditional handpainted signs. Powers uses the common sign as a tool to overstate the importance of signs to guide us through a confusing world. "It’s drag yourself to work day," reads one. Another depicts a lighthouse stamped with the word "You" beaming light onto the word "Me." The artist envisioned the signage as an emotional wayfinding system which encourages pedestrians to not only navigate the city streets but explore their own inner alleys and avenues. 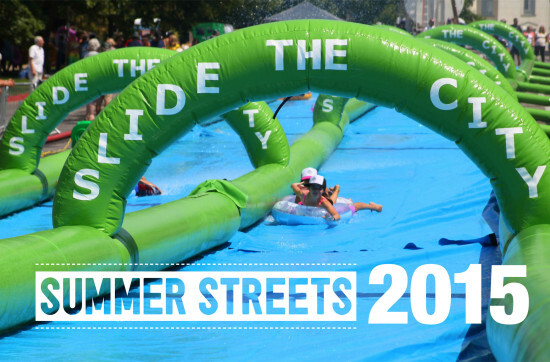 The 30 signs are being exhibited at four of the intersections earmarked as Summer Streets – part of an annual celebration of car-free NYC streets in which seven miles of streets are reappropriated by pedestrians and cyclists for three consecutive Saturdays in August. 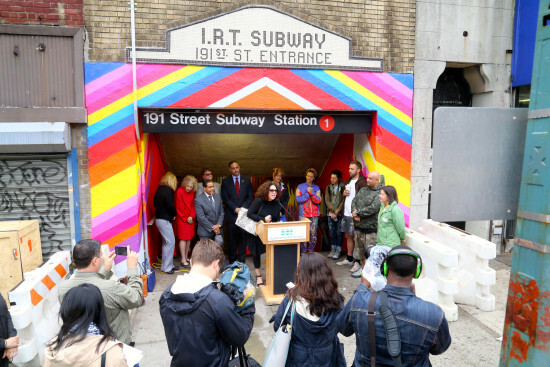 Powers’ artwork will go up at four Summer Streets rest stops: Midtown at 25th Street and Park Avenue; Astor Place at Astor Place and Lafayette Street; SoHo at Spring Street and Lafayette Street, with the majority to be displayed at Foley Square at Duane Street and Center Street. On a New York City map, the seven-mile roadway that cuts through Queens is designated as Queens Boulevard. But to many New Yorkers, the notoriously dangerous street is known by another name: the Boulevard of Death. According to the city, 185 people (most of them pedestrians) have been killed on the boulevard since 1990; over that time, scores more have been seriously injured. For Mayor de Blasio—who wants to eliminate traffic deaths through a street safety campaign called Vision Zero—overhauling the Boulevard of Death was an obvious place to focus his attention. In March, the Department of Transportation presented a $100 million plan to transform an especially hazardous 1.3-mile section of the street where 42 people were killed or seriously injured between 2009 and 2013. The plan would fundamentally change the geometry of the street by widening sidewalks, shortening crosswalks, reorganizing slip lanes, and creating pedestrian plazas and protected bike lanes. “Work has begun to turn Queens Boulevard into a Boulevard of Life—literally remaking this street, rewriting its future, making it safe for all,” said the mayor at a press conference along the street as construction kicked off in July. 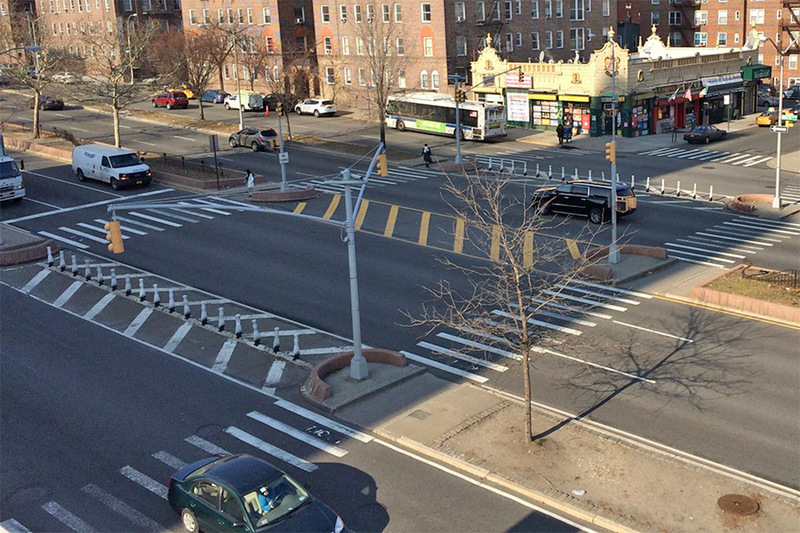 Transit advocates and numerous elected officials from Queens and around New York heralded the redesign of Queens Boulevard—especially its inclusion of protected bike lanes—as a “safe streets” homerun. 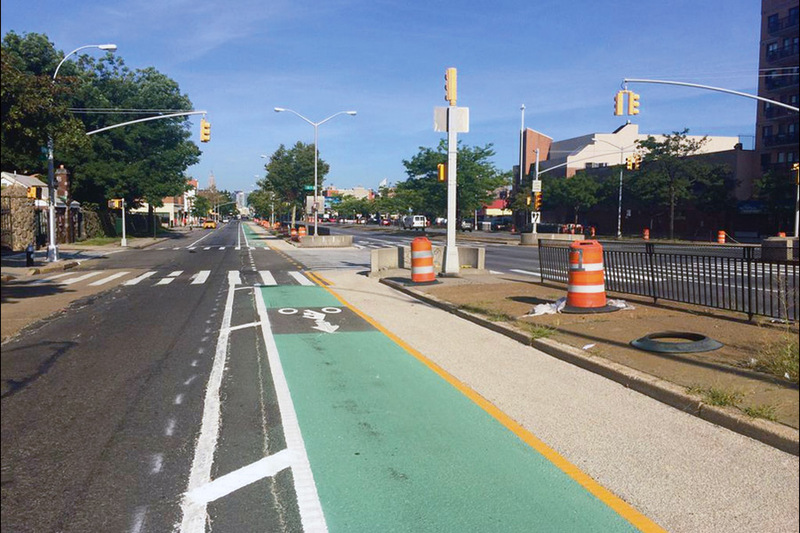 But to these same stakeholders, the laudable transformation of Queens Boulevard is an exception in the DOT’s track record of creating safe streets for cyclists. In the Vision Zero era—after Michael Bloomberg waged, and largely won, the battle to make New York more bike-friendly—the so-called “bicycle lobby” and its allies are questioning the DOT’s commitment to protecting people pedaling around town. As work was just beginning on Queens Boulevard, the DOT presented a $60 million plan to remake part of another notoriously dangerous roadway in New York: Atlantic Avenue. The redesign included traffic calming measures to protect pedestrians, but like many recent road diets proposed and implemented by the department, it lacked any bicycle infrastructure. To the added chagrin of cyclists, as these plans have been rolled out, existing bike lanes across the city have been worn into oblivion while others have failed to reappear following street resurfacings. DOT Deputy Commissioner Ryan Russo said the criticisms levied at the department are not reflective of the reality on the ground. “People should be impatient, they should want things to come quickly, but there has been a process,” he said. Russo explained that while certain road diets may exclude bike lanes, they can be the first step in convincing skeptical communities that precarious streets can become complete streets. “We have to get people from A to C,” he said. “That doesn’t necessarily mean every single street has to have a bike lane initially or when you do a project.” In the Vision Zero era, he continued, redesigning a dangerous intersection might initially get priority over a bike lane. The idea is that once a street is made safer for all users (cyclists included), the DOT can go back to a community board with a more substantial focus on cyclist safety. To Ben Fried, the editor-in-chief of StreetsBlog, a popular pro-transit publication, this strategy amounts to unnecessary “self-censorship” on the part of the DOT. Since road diets often meet community resistance whether they include bike lanes or not, the DOT “might as well propose the bike lane anyway,” he said. To many advocates, the best way to create support for bike lanes is to implement bike lanes. Overall, the DOT is bullish on its bike lane record—especially outside of Manhattan. 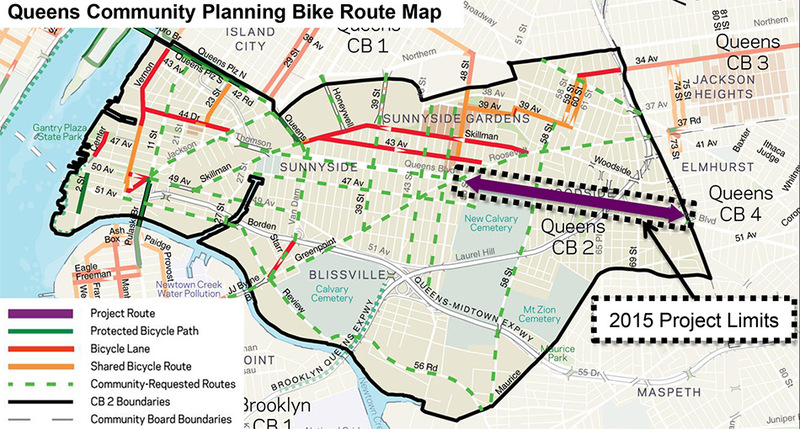 The department highlighted bike networks it has proposed or implemented in Long Island City, Ridgewood, Queens, Brownsville and East New York, and around the Harlem River. Each of these plans includes a mix of bike infrastructure from shared lanes to protected lanes to bike pathways. 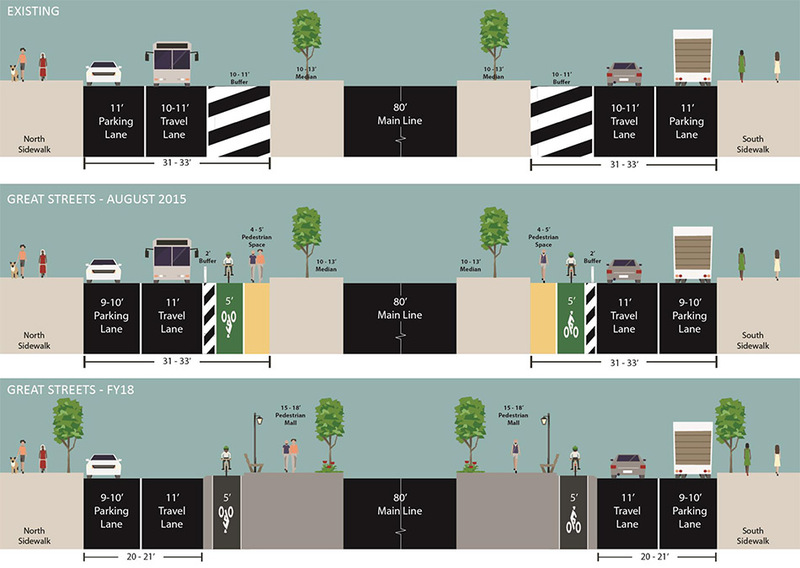 In August, Commissioner Trottenberg also announced that the DOT would be presenting plans for a bike lane on Amsterdam Avenue, a project cyclists and local officials have been requesting for years. The DOT plans to install 50 miles of bike lanes per year, at least five of which will be protected. Dutch Kills Green park adjacent to elevated tracks in Long Island City. Building on its success in developing research that led to the High Line and the first purpose-built NYC Taxi, the Design Trust for Public Space partnered with the New York City Department of Transportation (NYCDOT) on a two-year research project exploring in-depth the 700 plus miles of elevated infrastructure across New York City, and the spaces below. The results of this study have been published in a new book entitled Under the Elevated: Reclaiming Space, Connecting Communities. The book was developed by Design Trust fellows Neil Donnelly, Susannah Drake, Krisanne Johnson, Chat Travieso, and Douglas Woodward. Together, the team analyzed spaces under bridges, highways, subway tracks, and rail lines as a comprehensive network of underutilized urban space. They envisioned new strategies for developing these sites, as well as a criteria for choosing the most potentially useful ones. 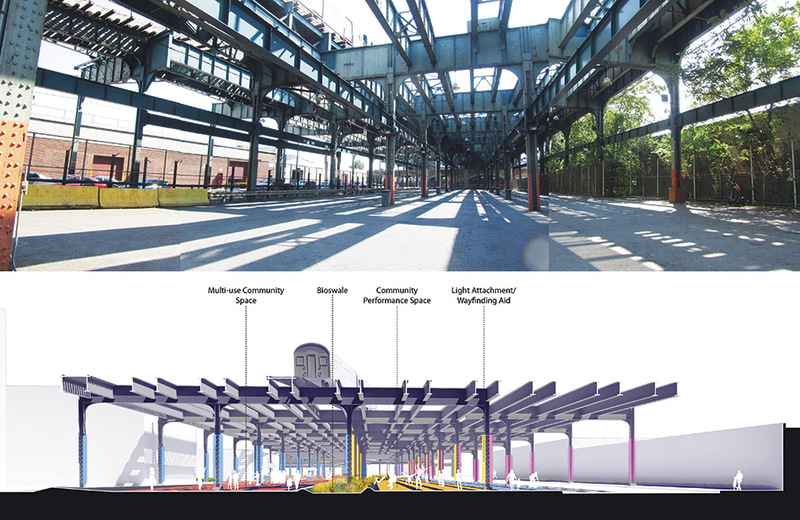 Existing uses of the space along Division Street under the Manhattan Bridge (left), and Division Street Pop-Up installation (right). Douglas Woodward, vice president of Design + Development at Edison Properties told AN that the project started in 2001 when the Design Trust recommended that the 33 urban spaces under the High Line should be considered equally important as those above it. Edison Properties wanted to figure out what to do with the plots they owned, so they approached the Design Trust, who put out a call for fellows. "Rather than having an urban designer or architect, we felt we should have a landscape architect," explained Woodward. 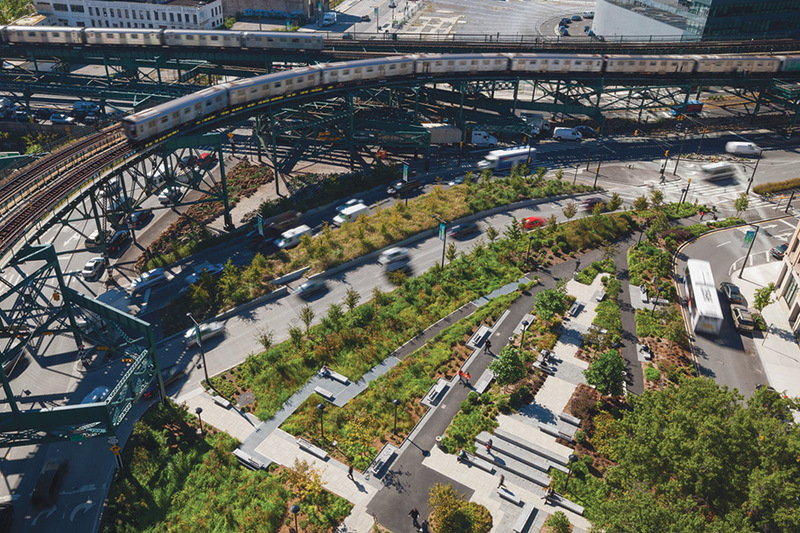 Drake approaches urban design with an ecological focus, having previously received EPA grants for pilot projects to improve stormwater management on the Brooklyn Queens Expressway. However, this is only one part of the larger equation of Under the Elevated. "We always want to improve underused places, ecologically, culturally and socially," said Drake. "These are places where transit cuts through human scale things." Elevated transit infrastructure in New York City (left), Broadway and Flushing Avenue under the elevated JMZ subway line in Brooklyn (right). 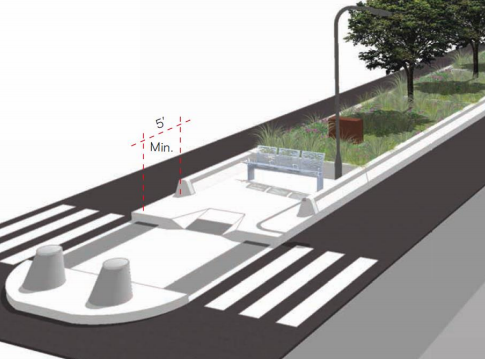 NYCDOT, a collaborator on the project, has been searching for and realizing innovative urban design strategies in recent years, illustrated by such work as the Plaza Program and the Green Infrastructure Unit. 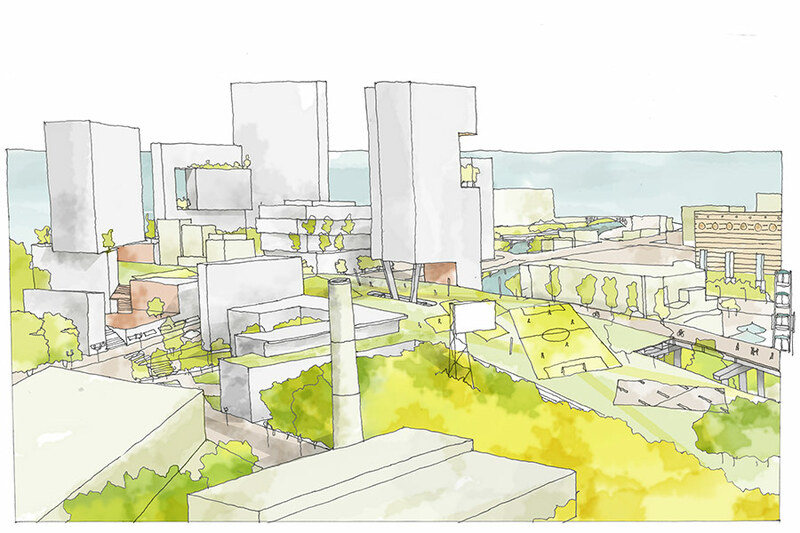 Its mission for Under The Elevated is to empower communities to improve those leftover, underused spaces, and reconnect them to the urban fabric. What is next for the program? "We are talking to the DOT now, trying to find some sites to kick the program off," said Drake. "We are all committed to it, but until we have something on the street it won’t seem that real to me. We have the pop-ups, but we need something permanent." Without having to abide by the same stringent regulations as most long-term urban design projects, pop-ups have proved to be a good tool for experimentation. The pilot projects, while more permanent, are still recognized as tests which can push the envelope. View of the landing of the Queensboro Bridge (left). Under the Ed Koch Queensboro Bridge, the pilot charging stations could become permanent productive landscapes (right). "This is the first comprehensive approach. It is good to look at [underused spaces under the elevated] as a system and how they can benefit the city,” explained Gagliardi. “We are testing some solutions over the next few months mainly around lighting, because it is the main complaint we get." 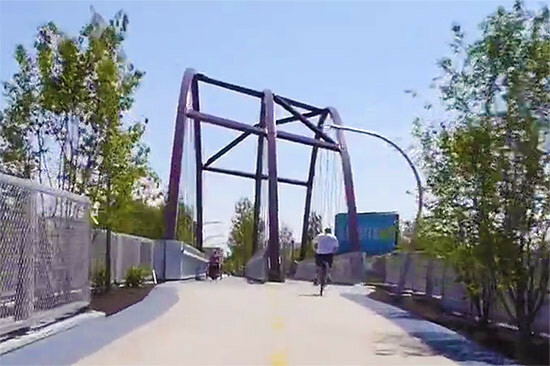 NYCDOT has engaged Sam Schwartz Engineering to look at the spaces on Livonia Avenue in Brownsville, and has also sought the expertise of other designers whom the agency has worked with in the past. The goal is to establish a toolkit of tried-and-tested strategies to enhance spaces under the elevated. View of a fenced-off space beneath the tracks at Broadway Junction (top). Redesign recommendations for Broadway Junction in Brooklyn (above). NYCDOT has identified pilot sites to inform its larger framework called the EL Space Program. It will address sites in Sunset Park's Industry City at 36th Street and "Rampland" in Long Island City along Dutch Kills Street—with the hope to get funding for a more comprehensive program. The pilot program is funded through public and private sources and will depend partially on how the Department of City Planning (DCP) rezones these areas. NYCDOT is working with City Planning to incorporate elevated spaces into housing and zoning initiatives. For example, The Jerome Avenue area in the Bronx has been the focus of recent rezoning efforts, and the city has expressed interest in improving lighting in places under the elevated infrastructure as part of its economic development strategy. Project Underway along the Rockaway Freeway. The question is whether these improvements will come to fruition. 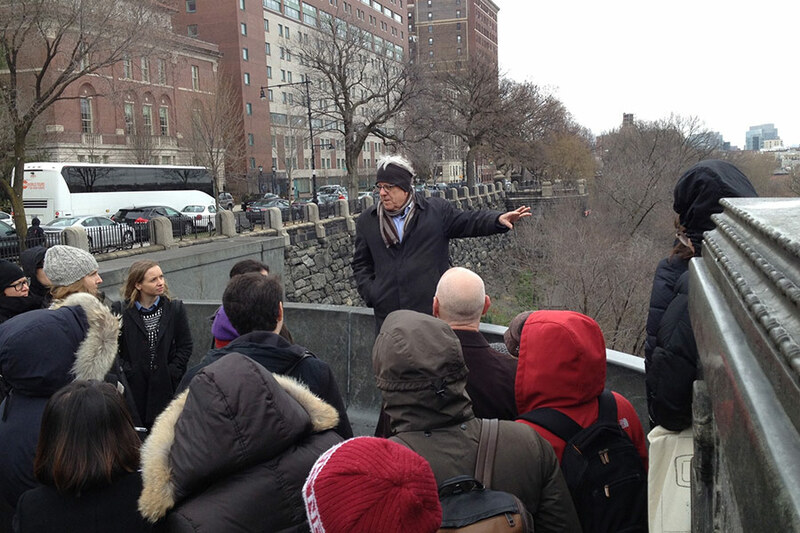 "I think it’s more real than the High Line," said Gagliardi. "We need comprehensiveness to help plan strategies and plan criteria. What places are best used for industrial operations? Which are best for the pedestrian?" The ultimate success of this program will likely be the strategies born from this study. These forgotten, underused tracts, however, are not just found in New York City. They are ubiquitous in most cities in post-industrial America. The study has far-reaching potential, and could serve as a lesson in how to exploit and make good use of underutilized spaces. 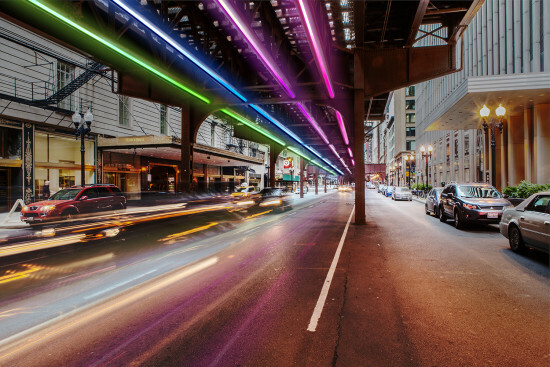 Under the Elevated: Reclaiming Space, Connecting Communities is available for $30.00 from the Design Trust. 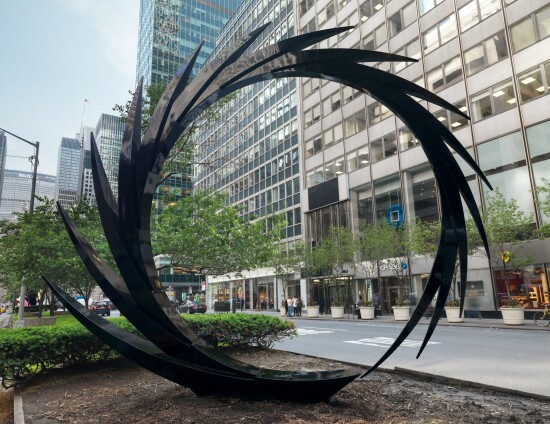 Santiago Calatrava, currently the darling of George Clooney, has set up seven blade-like sculptures along Park Avenue in New York City. The installation is a collaboration between the Marlborough Gallery, the New York City Parks Department, and the Fund for Park Avenue. The aluminum sculptures each have an expressive form that is classic Calatrava, but are not the all-white creations that we have come to expect from the architect. No, these pieces are painted red, black, and silver. The installation runs until mid-November meaning that it should close right around the time that Calatrava's long-delayed World Trade Center Transportation Hub finally opens. Take a look at the gallery below for a closer look at the sculptures, and if you're in New York and want to see for yourself, the pieces are on Park Avenue's median between 52nd and 55th streets. The public debut of the Texas Department of Transportation’s $6 billion plan to re-route I-45 around downtown Houston has citizens, planners, and city leaders atwitter about whether to demolish or repurpose a section of freeway known as the Pierce Elevated. Houston needs an urban icon, said Marcus Martinez, a designer at the Houston office of national architecture firm Page. 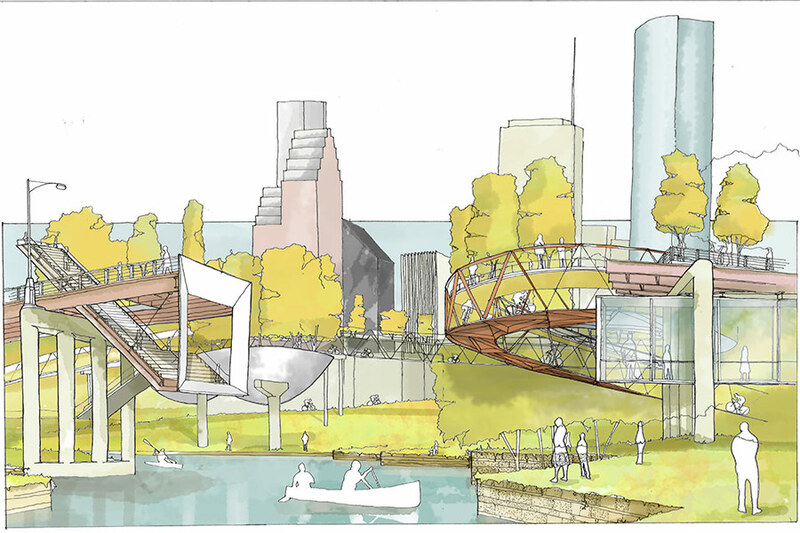 Martinez believes the Pierce can be saved and reprogrammed into an elevated park development connecting Buffalo Bayou, downtown, and adjacent neighborhoods. He has been working pro bono on a proposal called the Pierce Skypark with Tami Merrick and John Cryer, also of Page. “We are due for something big that puts us on the map and attracts people from all industries,” said Martinez. “Our chief goal is to keep it and turn it into something public and transformational for the city. It could be a variety of programming and flavors as well.” And it would be a nod to the city’s heritage instead of razing the structure completely. 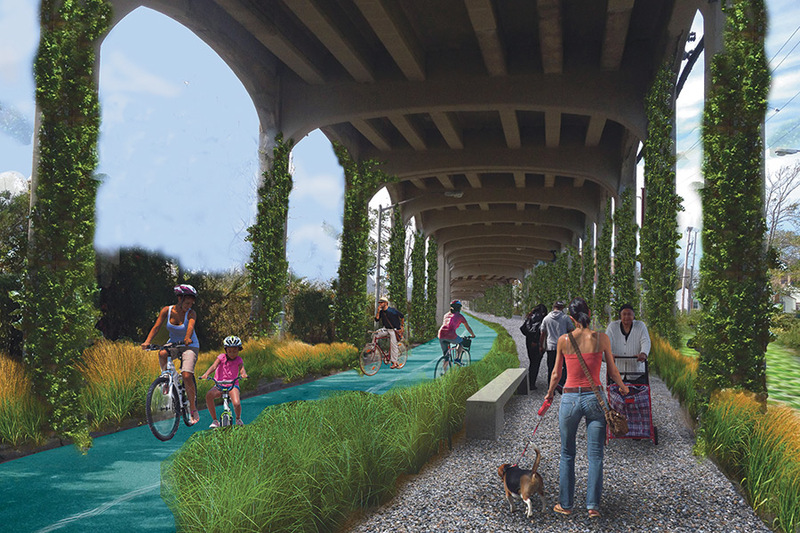 As TXDOT proposes a plan to re-route I-45 around downtown Houston, architects at Page have proposed transforming a section known as the Pierce Elevated into park land and open space, as well as retail, housing, and offices. 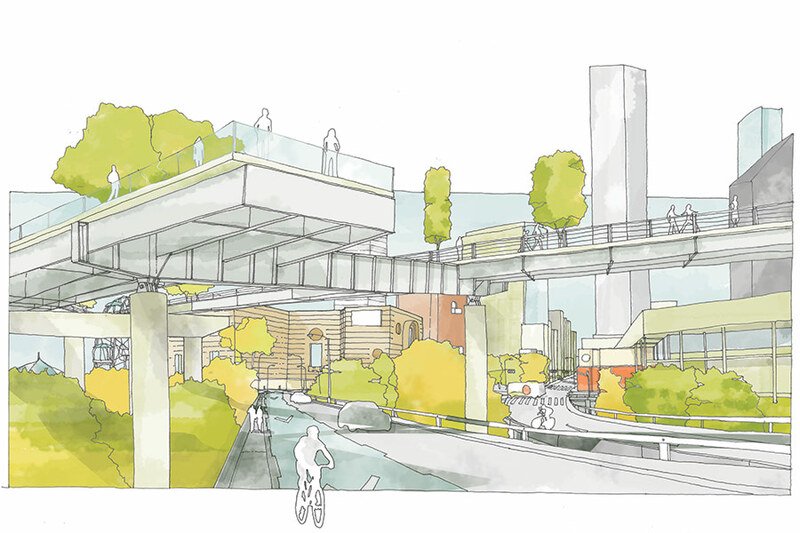 The Pierce Skypark is an optimistic vision to turn a two-mile stretch of elevated freeway (roughly 3 times the size of New York’s High Line) into an amenity for citizens and visitors. 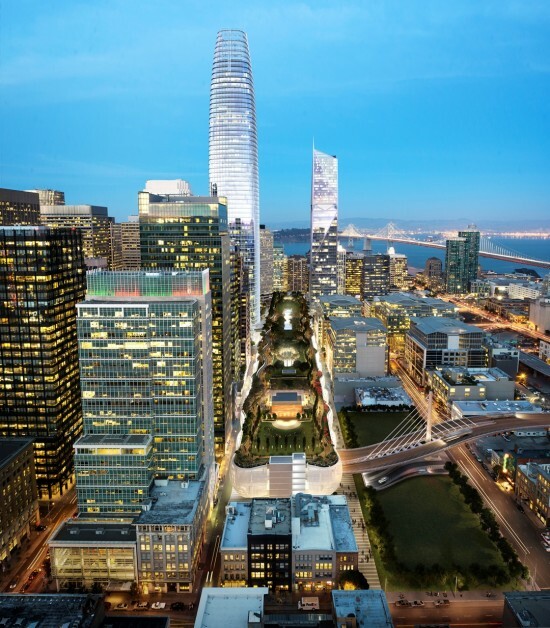 Programming above and below the existing structure could range from parks and trails to public space, retail, housing, and office space. A master development strategy needs to be created, Cryer said. A myriad of public and private conversations have ensued about the potential of transforming the 37.7 acres of the Pierce that currently afford a view of a giant neon cross. Comments have come from journalist Lisa Gray of the Houston Chronicle, urban and environmental historian Dr. Kyle Shelton of the Kinder Institute for Urban Research at Rice University, Bob Eury of the Houston Downtown Management District, and John S. Jacob of the Eastwood Civic Association. At three public meetings attended by more than 500 people across the city, TxDOT has released intricate maps, animated renderings, and data tables showing various routes, as well as the environmental and statistical impacts of its rerouting plan. It involves the widening, depression, and elevation of three segments of I-45 from Beltway 8 continuing to downtown connectors and around the George R. Brown Convention Center. Parts of the proposal in segment 3 cut through the Mexican Consulate and the South Central Police Station in Third Ward, and will raze a public housing project called Clayton Homes along with the Pierce Elevated.